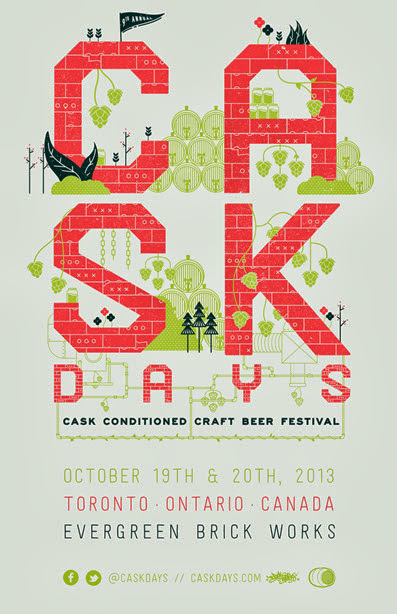 I'm giving away a PAIR of tickets to CASK DAYS worth $60*! Tickets to this event are already 90% sold out. As a major contributor to the Ontario craft beer community, the family behind Toronto mainstay barVolo, have taken Cask Days (Twitter: @CaskDays, Facebook: Cask Days) and elevated it into one of the most coveted craft beer events in North America. Along with featuring over 200 cask conditioned ales from over 100 Canadian microbreweries, highlighted this year at Evergreen Brick Works will be 36 beers from the UK, the international brewery feature...the roots of "real ale". Not only will there be premium one-of-a-kind brews, the event will also offer a standout line-up of beer focused workshops, art, music, food pairings ("the eats are as epic as the beer") and one-on-ones with brewers on site. This year, Cask Days is raising money to support UNITY Charity which engages and empowers youth aged 10 to 18 by implementing school and community programs. Contest starts on Thursday, October 3rd and ends on Thursday, October 10th at 12PM. One lucky winner will be drawn randomly from www.random.org once the contest is over on Thursday, October 10th and I will announce the winner shortly after.